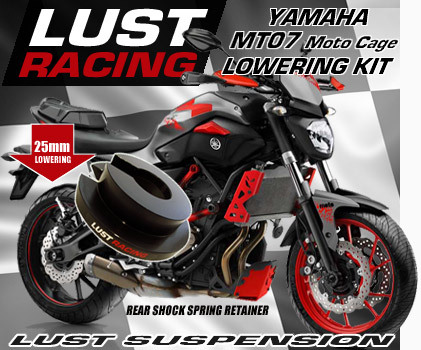 Lowering kit for Yamaha MT07 Moto Cage by Lust Racing. Lowers the rear suspension and reduces the seat height. Excellent aftermarket accessory of top quality stronger than standard parts replaced. Designed engineered and manufactured in Europe by LUST Racing. Recommended accessory for short riders reduces the seat height by 25mm / 1 "inch. Replacest the standard spring retainer on the rear shock absorber with a new lowering one made in top quality special steel. The lowering kit for Yamaha MT 07 Moto Cage comes with installation instructions. Made to last the lifetime of your bike.